In this article I am going to give an overview of Radio & Radio Broadcasting History of Bangladesh. Advances in technology have given people more ways to access an increasing amount of information. Local and international news can be read in the newspaper, listened to on radio, watched on television and found on cell-phones or online. For those with access to these options, a wealth of information is always readily available. In countries where free expression is suppressed, access to technology is expensive or illiteracy rates are high, radio continues to play an important role in information sharing. Radio is the technology of using radio waves to carry information, such as sound, by systematically modulating some property of electromagnetic energy waves transmitted through space, such as their amplitude, frequency, phase, or pulse width. 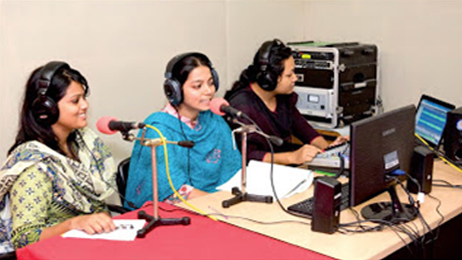 Bangladesh Betar or BB is the state-owned radio broadcasting organisation of Bangladesh. It was also known as Radio Bangladesh between 1975 and 1996. Radio transmission in the region now forming Bangladesh started in Dhaka on December 16, 1939. Initially, the station was located in old Dhaka. Later, the station was relocated to Shahbag. It played an important role during the Bangladesh Liberation War of 1971. On March 26, 1971, the broadcasting center of Radio Pakistan was used to transmit a declaration of independence, which was picked up by a Japanese ship in the Chittagong Harbor and re-transmitted. During the war, it was known as Swadhin Bangla Betar Kendra (Independent Bengal Radio Station). Because of heavy shelling, the station had to be relocated several times, and ultimately moved to Calcutta on May 25, from where it would broadcast until the end of the war. On December 6, it was renamed Bangladesh Betar.